Three Counties Hotel01432 299955work01432 275114fax HotelThree Counties Hotel is a purpose-built, 60 bedroom hotel set in 3 1/2 acres of landscaped gardens with free parking for up to 250 cars, less than a mile from the heart of Hereford City. Three Counties Hotel boasts well-appointed en-suite rooms with flat screen Freeview & Sky televisions, hairdryers, tea & coffee making facilities and room safes and we are delighted to be able to offer ground floor rooms. We have two rooms which have been adapted to offer easier access for the disabled and have a number of interconnecting bedrooms which are ideal for families. Of our 60 bedrooms, 32 are located in an annexe near the main building and offer extra privacy and parking right outside the door. Free Wi-Fi is available throughout the hotel. We also offer 24 hour room service and a laundry & dry cleaning service. Our elegant restaurant is open every evening from 6.30pm offering a great selection of food and wine. Our bar overlooks a pretty pond and is open every weekday evening from 5.30pm and 12 noon onwards on a Saturday & Sunday, tasty bar food is available. 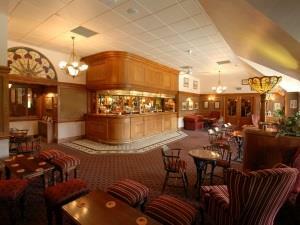 we can offer extensive conference and banqueting facilities for up to 350 people. From Hereford City centre, take the A465 to Abergavenny - over the river bridge and right at the roundabout. Continue for approx. half a mile and we are on the righthand side (after McDonalds).